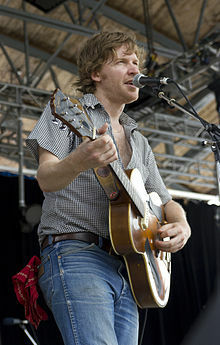 Doug Paisley is a Canadian alternative country artist with record label No Quarter Records. He was born in Toronto. Paisley's "What About Us?" was featured in Mojo magazine as part of a complimentary CD entitled New Harvest. Paisley has previously toured with Bonnie Prince Billy under the name Dark Hand and Lamplight with artist Shary Boyle. Boyle would illuminate her art in the background while Paisley played the guitar and sang his songs. The pairing received recognition when they were selected to showcase at the Brooklyn Academy of Music in 2008. Doug performed for ten years alongside Chuck Erlichman as a duo entitled Russian Literature and as a tribute act entitled Stanley Brothers. Paisley's 2010 release Constant Companion receives positive reviews in major publications such as The New Yorker and Spin. Paisley has been featured both on CBC Radio in Canada and on National Public Radio in the United States. His 2014 album Strong Feelings featured guest appearances by Mary Margaret O'Hara and Garth Hudson. It received positive reviews from Rolling Stone and Pitchfork. ^ Young, Andy (13 February 2009). "Doug Paisley: The End Of Solitude". npr.org. Retrieved 22 August 2009. ^ a b William Ruhlmann: "Doug Paisley" at AllMusic. Retrieved 10 December 2010. ^ "Covers Archive". Mojo. August 2009. Retrieved 22 August 2009. ^ "Doug Paisley". noquarter.net. 2009. Retrieved 22 August 2009. ^ Menconi, David. "Constant Companion". Spin. Retrieved 4 February 2011. ^ Will, Hermes. "Strong Feelings". Rolling Stone. Rolling Stone. ^ Steven, Hyden. "Doug Paisley: Strong Feelings". Pitchfork. Pitchfork. ^ "Doug Paisley". Allmusic. 2008. Retrieved 22 August 2009. ^ DeRiso, Nick. "Doug Paisley featuring the Band's Garth Hudson – Strong Feelings (2014)". Something Else!. Retrieved 17 January 2014.